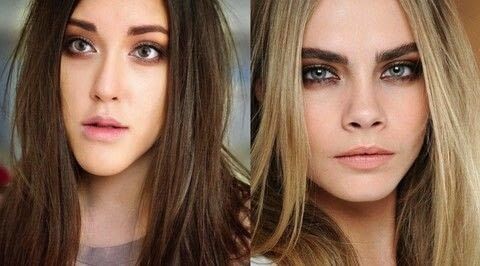 How to achieve Cara's classic natural beauty makeup look! Cara doesn't tend to wear much makeup unless she's doing fashion shoots, she has natural beauty hence why she doesn't need to wear much! Here she wears a bronze and copper smokey eye with some natural eyelashes and her signature big brows! I already added foundation and set it with a compact face powder. For my brows I shaped them slightly larger than my own with pencil and brow gel. I then added eye primer to make the eyeshadow stand out and last longer. Apply a copper eyeshadow over the top of the other eyeshadow all over the lid and up to the brow bone and also around the eye to the lower lash line. In the eyelid crease apply a darker brown shimmery eyeshadow to make your eye crease appear deeper and also bring this round the eye to the lower lash line. Shade and contour your nose, I made my nose contour come out at the bottom since Cara has a rounded nose at the bottom.